A massive dust storm developed in response to Wednesday's high winds. This huge cloud of blowing dust stretched northeastward from northern Mexico across southern and southeastern New Mexico, West Texas, and into Oklahoma and Kansas. Courtesy Of Otero County Electric Coop. Quote- "Sunday was a productive day for line crews working on the outage. The Sac Peak line was re-energized restoring service to 90% of Timberon, along with Aspen Meadows, Aspen Groove, Bug Scuffle, Benson Ridge, Alamo Peak and Sunspot. If you still do not have electricity, please report the outage by calling 1-800-548-4660. After working 16 hour days since the wind storm, crews are exhausted but will return Monday morning to finish making repairs to lines feeding those still without service in Cloudcroft, Timberon and Long Ridge." SE NM & W TX High Wind Event. 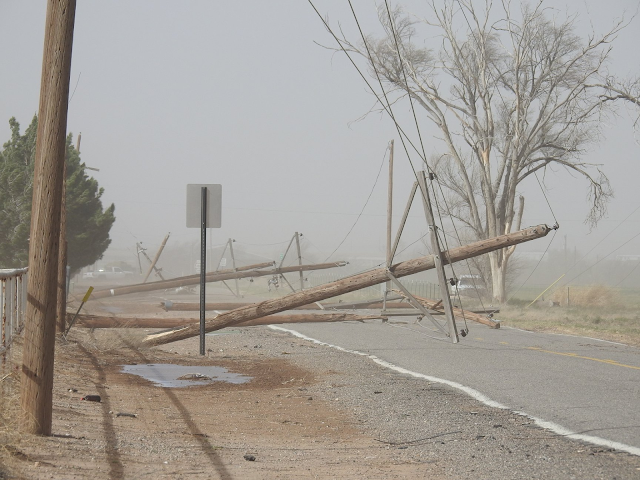 High Wind Event March 12-13th, 2019 National Weather Service Midland/Odessa Despite West Texas and Southeast New Mexico being known for their breezy conditions in late-winter/early-spring, an anomalous wind event transpired across the Southern High Plains during the evening March 12th , and through the morning and afternoon of March 13th, 2019. The setup was historical in many facets with areas over the Central High Plains experiencing wide spread blizzard conditions, severe weather, high wind damage, and multiple site surface low pressure records broken over the storms life cycle. What Happened? A strong storm system over the Western US strengthened over the course of a few days, leading to one of the highest impact weather events across the Central and Southern Plains in recorded history. High winds were common for a large chunk of the Rockies and the Southern Plains with severe blizzard conditions over Eastern Colorado, Wyoming, and the Dakotas. In West Texas and Southeast New Mexico, winds were the story, with persistent wind gusts in excess of 60 mph in many locations the night of March 12th , and throughout the day of March 13th . High Wind Warnings were issued in anticipation of this significant high wind event. Winds easily reached these significant thresholds across the region. For more on the meteorological evolution of the historical storm system, please refer to the Meteorological Synopsis below. 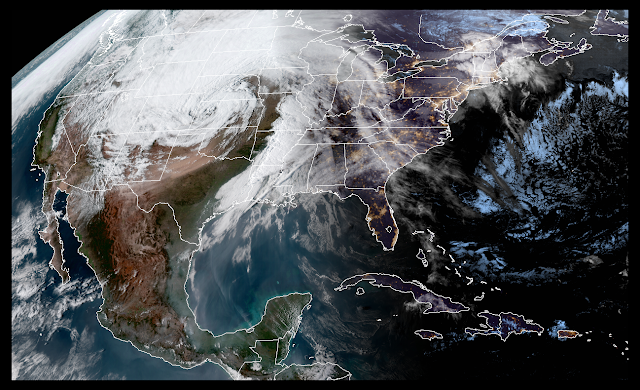 Meteorological Synopsis: On the morning of March 13th, a potent, negatively tilted upper-trough was traversing the Central Rockies with a rapidly developing surface cyclone over the lee side of the Continental Divide in Southeastern Colorado. At the base of the trough, a very strong 300mb jet streak extended back across the Four Corners region and into the West Texas, Southeast NM High Plains. Through the course of the day, the surface low over Southeastern Colorado exhibited rapid surface cyclogenesis with intense pressure falls of more than 2mb/hr for several hours between 12z March 13th and 0z March 14th. The combination of the intense pressure falls and a coupled jet streak over the Southern Plains culminated in a very tight pressure gradient with deep mixing potential for strong winds to the surface. Strong wind gusts began from west to east with Southeast NM and the adjacent Guadalupe Mountains across Texas experiencing a sharp increase in surface wind gusts just after 14z March 13th. As the day unfolded, deep mixing with ample sunshine led to winds mixing efficiently to 700mb where 60 to 70 knot winds were positioned through the course of the afternoon. 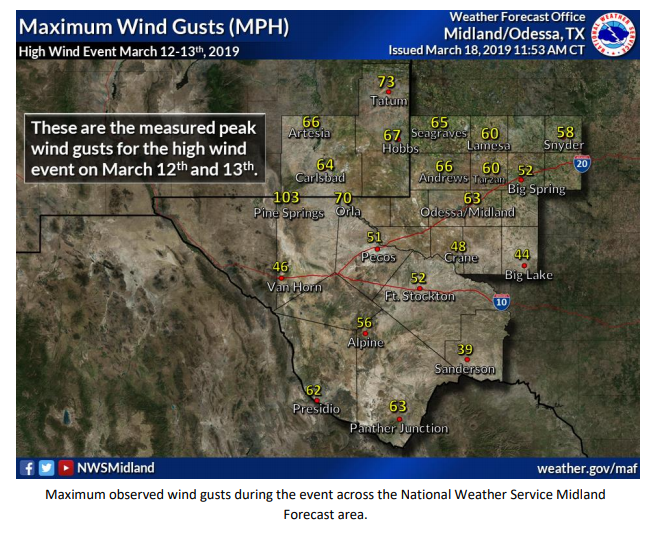 Damaging wind gusts of 60-80 mph were observed across the Southeast NM Plains and the Permian Basin with gusts of 90+ mph across the Guadalupe Mountains. 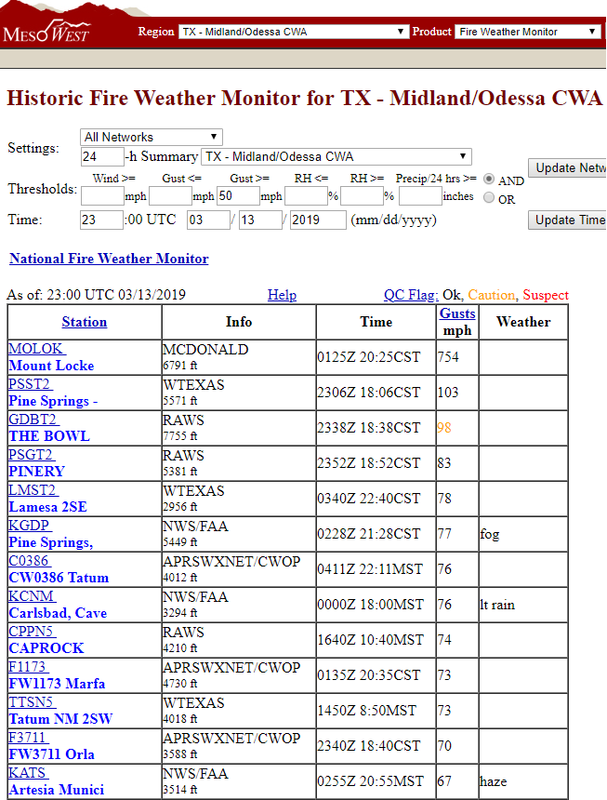 The strongest recorded wind gust of 103 mph was measured at Pine Springs, TX from the local Guadalupe National Park Mesonet at 1:09 pm CDT. Winds slowly decayed around sunset, but windy conditions prevailed for several hours after as the local pressure gradient was slow to lift while the storm progressed to the northeast across Kansas and Nebraska. 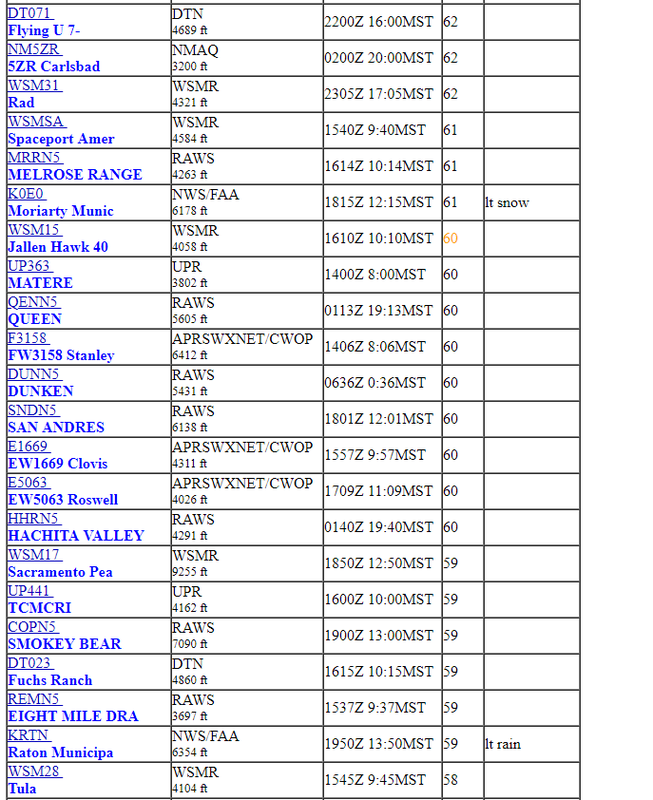 * Wind events listed in chronological order of occurrence Summary: Strong winds were experienced over a large portion of the NWS Midland forecast areas with winds over 60 mph observed for several locales. The storm itself was a true testament to the power of rapidly developing surface cyclones with impacts from this system stretching across the Rockies and the entire Central US. 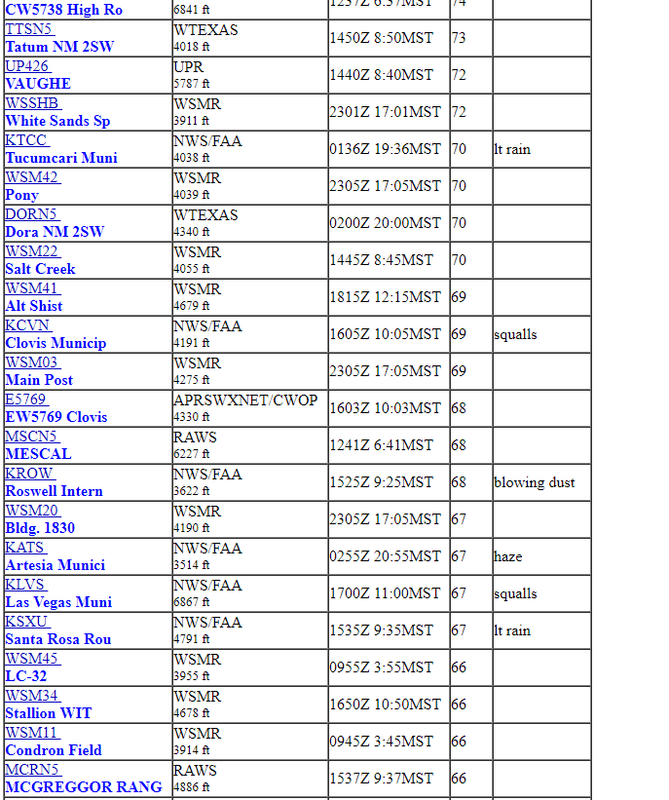 The 103 mph observed wind at Pine Springs Mesonet is in the top reported wind gust from anywhere in the United States during the storms life cycle. This event will go down as one of the top non-thunderstorm wind events in the West Texas, Southeast New Mexico corridor. Overview… Strong westerly winds developed just after sunrise across the higher terrain of the Sacramento Mountains in Otero county. Sustained winds from the west of 60 to 70 mph with much higher gusts persisted through most of the day. By 11 AM the Village of Cloudcroft lost all power and would remain without power for more than 24 hours. 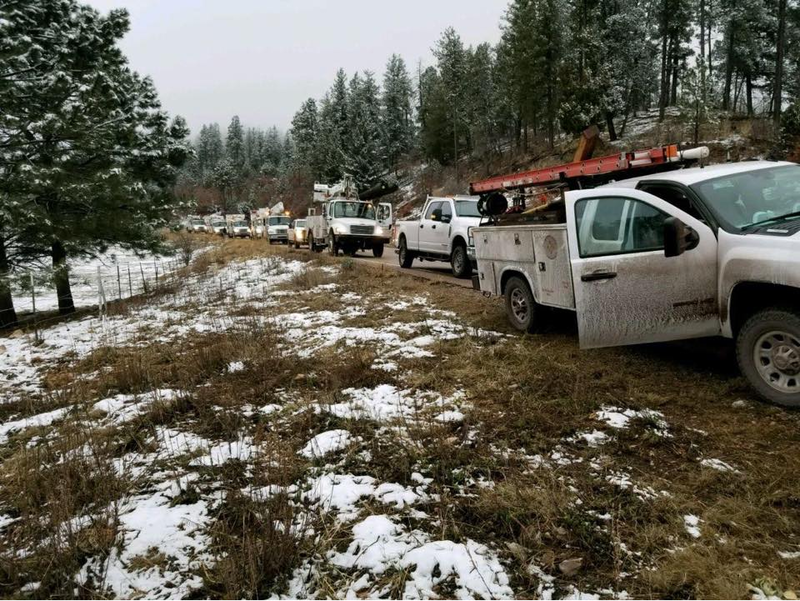 Hundreds of ponderosa pines were either uprooted or snapped within the Village of Cloudcroft resulting in damage to 30 structures, 10 vehicles, and completely blocking 15 roads. Across the entire area surrounding Cloudcroft it is estimated that more than 1000 trees were either snapped or uprooted. Location 1: 11:10 AM Estimated Max Wind Speed: 107 MPH A total of three large trees fell on this property. The largest measured approximately 4 feet in diameter at it’s base. The estimated wind gust of 107 MPH snapped this tree completely at it’s base, with the tree falling onto the home. Shortly thereafter another large tree across the street was uprooted and also fell into the home. Finally, a third tree in the yard next door was uprooted and fell on a car parked next to the home. In addition, several power lines came down as a nearby utility pole was also snapped (likely by a falling tree). Location 2: 11:40 AM Estimated Max Wind Speed: 90 MPH A nearly 100’ tall ponderosa pine with a trunk measuring a little more than 2 feet in diameter was uprooted in the back yard of this home, falling directly on the roof. Upon impact, the trunk of the tree snapped in half with the top portion of the tree landing in the front yard. Location 3: 11:52 AM Estimated Max Wind Speed: 94 MPH Two separate trees came crashing down on this residence in southern parts of Cloudcroft. One tree was uprooted, falling across the front deck of the home and crushing a red Porsche parked in front of the home. A second tree, approximately 2 feet in diameter snapped in half, falling on a truck that was parked next to the house. Location 4: 11:53 AM Estimated Max Wind Speed: 101 MPH A very tall ponderosa pine with a trunk diameter of almost 3 feet completely snapped just above its base, allowing the entire tree to fall onto the front of a two-story house. The max wind gust here was estimated to be around 101 MPH. This house is actually located just next door to location 2 where a tree was uprooted by a 90 MPH wind gust less than 15 minutes earlier. Location 5: 3:20 PM Estimated Max Wind Speed: 94 MPH Two trees fell on this property just south of Highway 82. The first was uprooted and fell across the front yard, narrowly missing this house. However, a second tree from the next-door neighbors back yard also was uprooted and fell directly on the home, puncturing a hole in the bedroom ceiling. 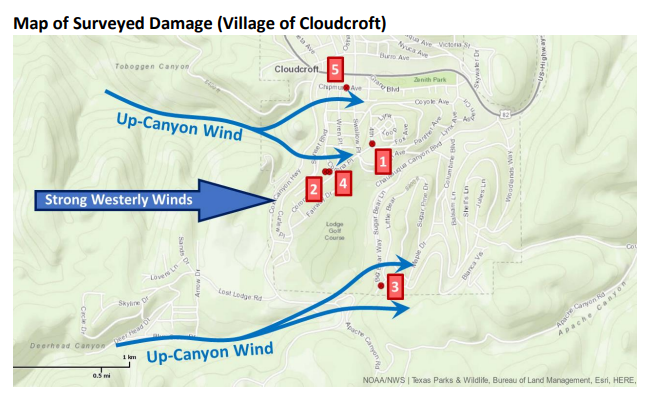 Survey Summary… This damage survey was conducted in the Village of Cloudcroft in Otero county following public reports of over 100 MPH wind gusts and reports of extensive damage within Cloudcroft and nearby areas. Extensive tree damage was observed including both uprooted ponderosa pines as well as pines snapped either at their bases or midsections. The Cloudcroft Fire Department escorted three meteorologists from NWS El Paso to multiple locations where both tree and property damage were located. Wind speed estimates based on the damage done to these hardwood trees suggested an extended period of stress due to sustained winds of near 70 MPH. The most significant tree damage appeared to have been caused by wind gusts exceeding 90 MPH with the highest estimated wind speed estimated to be around 107 MPH. Meteorological conditions at the time included very strong gradient winds (blowing primarily from the west) across the area extending from the surface to well above mountain top levels. Light to moderate frozen precipitation combined with the strong winds led to excessive rime ice build up on the windward side of the exposed trees. This ice accumulation likely caused the trees to become top-heavy, thus increasing their vulnerability to the strong wind. The majority of the significant damage surveyed was located on a north to south exposed ridge line on the windward side of the mountain. Most of the damage also appeared to be located at the edge of canyons, where funneling of up-canyon winds resulted in the higher wind gusts that were ultimately responsible for the most extensive damage. 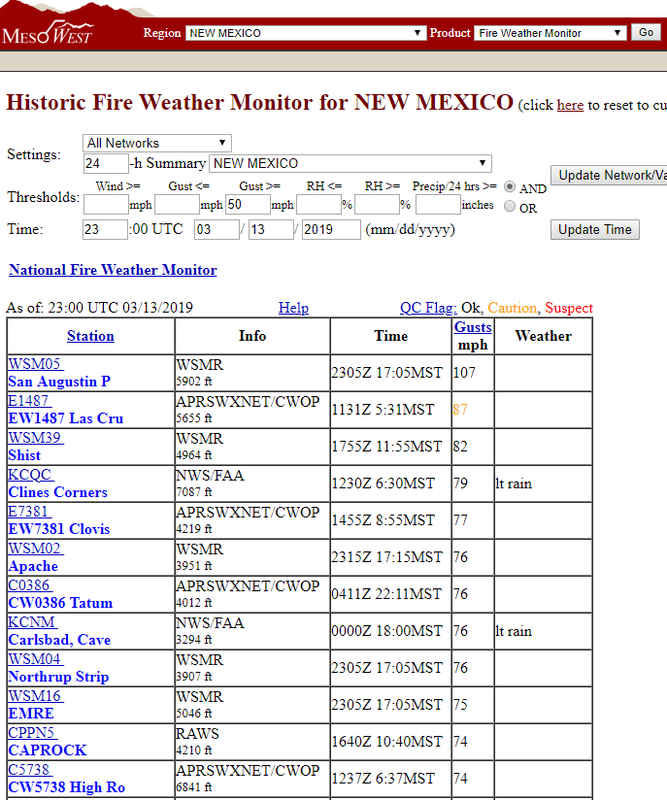 Report Courtesy: Jason Laney – Warning Coordination Meteorologist (NWS El Paso) Greg Lundeen – Science and Operations Officer (NWS El Paso) Jordan Pegram – Meteorologist (NWS El Paso). 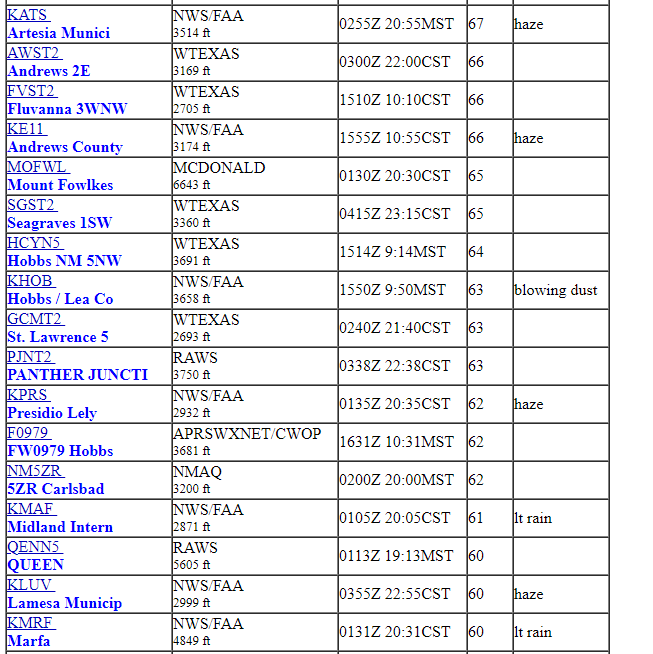 SE New Mexico Reported Peak Wind Gusts. 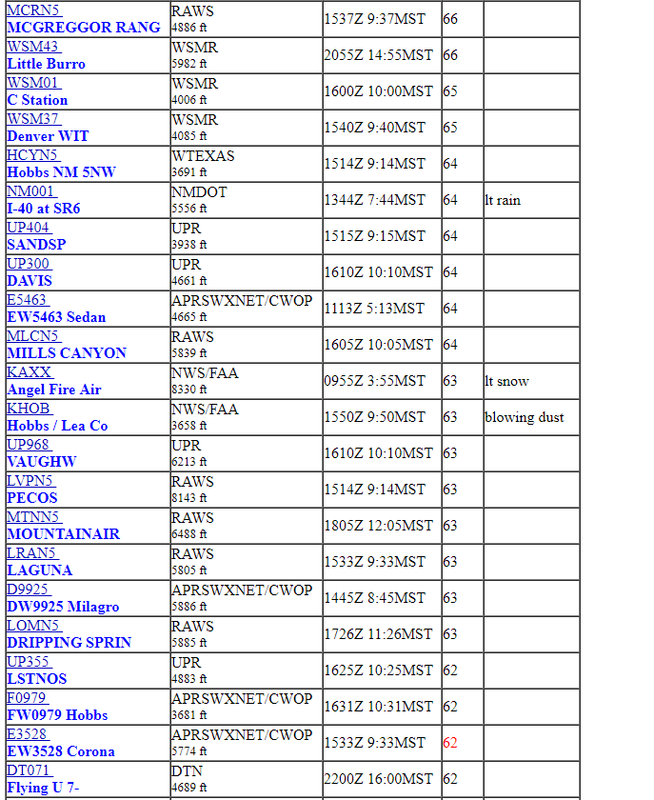 New Mexico Reported Peak Wind Gusts.